It is a little hard to believe we are coming to the end of a two year term! Where has the time gone? As we prepare to close out the 2012 Grange Year and embark on our 128th Annual Session October 18-20, 2012 it is important we all understand our function. First of all, to all the members of the Connecticut State Grange: this is YOUR convention! It is your responsibility and right to participate in YOUR convention. Familiarize yourself with the resolutions, speak with your delegates and let them know how you feel about these issues. Attend the sessions and programs; share in all your convention has to offer. Officers: Be prepared to perform your duties to the best of your ability. Be there as a mentor to all Grangers. We the Officers of the Connecticut State Grange are elected by the delegate body to serve them in their best interest. This year is an election year, when we met prior to Installation two years ago, I reiterated how we serve the membership of this State Grange and if we cannot, or do not, fulfill our obligation to the office or the membership we should not seek reelection. Those of you who fall in this area need to reflect on the two past years and seriously contemplate whether it is time for you to step aside and encourage others to be part of the Connecticut State Grange Officer corp. Again, we serve the membership; their best interest should be in the forefront at all times. Delegates: You hold the most responsibility and power during your State Convention. It is you who chart our course into the future. Your job is no small task, and should not be taken lightly. With this being an election year it is your obligation to tell us if we have performed our duties to your satisfaction, and if not, make the necessary changes. You will deliberate and vote on all resolution before you; your actions will determine the course for us as an organization, as a state and nation. Once you return to your home Grange or Pomona, it is your responsibility to your membership to report back to them the actions of the delegate body of the Connecticut State Grange. 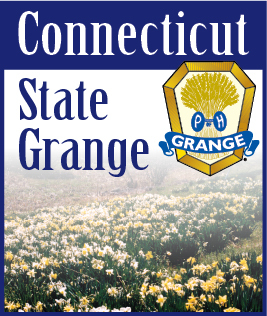 Brothers and Sisters, I know the 128th Annual Connecticut State Grange Session will be one for the records books because of the hard work of each member and Community Grange this past year. There is much to celebrate and many lessons to learn from. Sister Jodi Ann and I are looking forward to welcoming each of you on the 18th of October.